Chase Utley may be a Dodger, but he’s forever loved in Philly as he’s a lifelong member of the Philadelphia Phillies. And when he was traded to the Dodgers, we all wished him well and wanted him to “break a leg.” But we didn’t REALLY want him break a leg. Not really. Unfortunately, Utley is now in the news and in the middle of a mess for not a good reason. Now Utley finds himself in the middle of baseball’s hottest controversy after his hard takeout slide broke New York Mets shortstop Ruben Tejada’s right leg on Saturday night. Major League Baseball suspended Utley for two playoff games, and his agent said he will appeal. The Mets and Los Angeles Dodgers are tied at 1-all in the best-of-five NL Division Series. Game 3 is scheduled for Monday night at Citi Field, and it’s possible Utley would’ve been in the starting lineup against ace Matt Harvey. ”A two-game suspension for a legal baseball play is outrageous and completely unacceptable. Chase did what all players are taught to do in this situation – break up the double play,” agent Joel Wolfe said in a statement. The disputed play angered Tejada’s teammates and drew the wrath of Mets fans. The slide has led to a polarizing debate about whether such slides are dirty or merely aggressive baseball. The 36-year-old Utley made his big league debut in 2003 and is revered by Phillies fans for his hustle. Utley is fiery and feisty, gutsy and plucky, and He epitomized a gritty city that loves hard-nosed players. He might be the most popular player in Philadelphia sports history. And that’s not small statement. Philly is a sports town notorious for its toughness and never, ever booed Utley, no matter how badly he slumped. 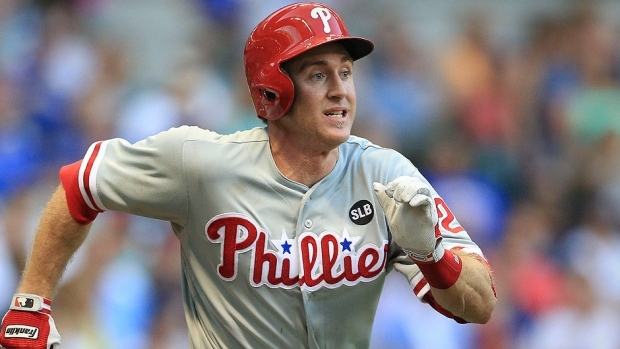 ”Chase is an iconic, generational player,” former general manager Ruben Amaro, Jr. said after the rebuilding Phillies traded Utley to the Dodgers in August. Utley’s style is more appreciated as a teammate than an opponent. He’s an intense guy who never smiled on the field, but he displayed rare emotion when he thanked fans after he was traded to Los Angeles. Utley was former manager Charlie Manuel’s favorite player, in large part because his work ethic rubbed off on younger teammates. Utley helped lead the Phillies to five straight NL East titles, two NL pennants and one World Series championship between 2007-11. He hit 243 home runs for Philadelphia, including 10 in the postseason and five in the 2009 World Series against the Yankees. So the problem is this: was Utley’s slide a dirty, diabolical, dastardly deed? That Utley is not a dirty player is not the issue. The fact is, some want to make Utley a scapegoat and a scoundrel, a villain and a felon, a rogue and a rascal because he broke another player’s leg. So that’s too bad, because breaking someone’s leg is not good. There are times when each and every one of us will be misjudged and mistaken, misquoted and misrepresented. And that’s just life. Next > What Happened To Lamar Odom?